Deep Learning is a subset of machine learning that allows machines to do tasks that typically require human like intelligence. The inspiration for deep learning comes from neuroscience, if you look at the architecture of Deep Learning Neural Networks, they are connected in a fundamental way that mirrors the brain. Deep-learning networks are distinguished from the more commonplace neural networks by their depth; that is, the number of node layers through which data passes in a multistep process. 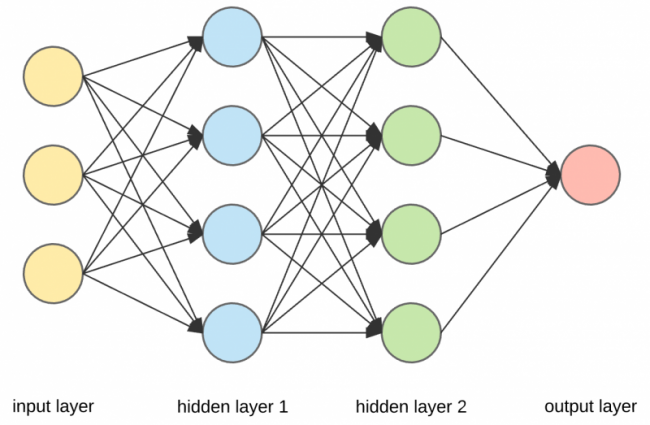 Earlier versions of neural networks were shallow, composed of one input and one output layer, and at most one hidden layer in between. More than three layers (including input and output) qualifies as “deep” learning. So deep as strictly defined means more than one hidden layer. In deep-learning networks, each layer of nodes trains on a distinct set of features based on the previous layer’s output. The further you advance into the neural net, the more complex the features your nodes can recognize, since they aggregate and recombine features from the previous layer. Let’s take a simple example of recognizing hand written numbers from 1 – 10. If 10 people wrote the numbers, the numbers will look very different from each person. For a human brain, it is fairly easy to identify these numbers. For a traditional machine it is impossible to detect and hence Neural Networks are used to mimic the way, neurons in the brain interact. These multiple hidden layers allow a computer to determine the nature of a handwritten digit by providing a way for the neural network to build a rough hierarchy of different features that make up the handwritten digit. For instance, if the input is an array of values representing the individual pixels in the image of the handwritten figure, the next layer might combine these pixels into lines and shapes, the next layer combines those shapes into distinct features like the loops in an 8 or upper triangle in a 4, and so on. By building a picture of these features, neural networks can determine with a very high level of accuracy the number that corresponds to a handwritten digit. Additionally, the model will learn which links between neurons are critical in making successful predictions during training. Over the course of several training cycles, and with the help of occasional manual tuning, the network will continue to learn and generate better predictions until it reaches desired accuracy. Thus, Deep learning allows machines to solve complex problems even when using a data set that is very diverse, unstructured and inter-connected. Deep learning networks excel at dealing with vast amount of disparate data. In fact, the larger the amount of data the more efficient Deep learning becomes and the more deep learning algorithms learn, the better they perform. https://abeyon.com/wp-content/uploads/2018/11/DeepL.jpg 638 960 Mallesh Murugesan https://www.abeyon.com/wp-content/uploads/2015/03/logo_abeyon_big-gray-300x85.png Mallesh Murugesan2018-11-27 15:21:322019-01-07 10:18:59What is Deep Learning? From the definition it is fairly apparent that all forms of machine learning (ML) rely on the availability of data, not just some data but large volumes of data. Therefore, in order to take advantage of ML, access to large sets of well-organized data is critical. As far as machine learning goes, there are several approaches; from a simple decision tree to multilayered neural networks, all depending on the task and amount and type of available data. There is no one-size-fits-all solution when it comes to a machine learning algorithm. Most times, the best solution is derived when working on real applications with real data because every organization’s data is unique. Solutions are derived by working with domain experts and creating custom neural networks. There are a few methods to teach the machine with data: supervised learning, unsupervised learning and semi-supervised learning. Supervised Learning: In supervised ML, the artificial intelligence (AI) model is given data that is labeled in an organized fashion. For example, one might provide pictures of cat with the labels. Once enough structured and labeled data is provided, the AI model built can recognize and respond to patterns in data without explicit instructions. The output and the accuracy of supervised learning algorithms are easy to measure making supervised learning the most common method of machine learning today. Unsupervised learning: You guessed it, it’s the opposite of supervised learning. Here the AI model is given data that is not labeled in an organized fashion. For example, one might provide pictures of animals (cats, dogs, etc.) without any labels. This method is used to identify underlying patterns or hidden structures from unlabeled data. The expectation is not to derive the right output but to explore datasets and draw inferences. This is rarely used today as the implications of unsupervised learning are unknown. Semi-supervised learning: This method falls somewhere between supervised and unsupervised data. In this scenario, the model is given a small amount of labeled data and a much larger pool of unlabeled data. Semi-supervised learning combines the best of both worlds by having improved accuracy associated with supervised ML and makes use of unlabeled data. Often, the process of labeling massive amounts of data for supervised learning is time consuming and expensive. This process actually tends to improve the accuracy of the final model while reducing time and cost. So what method should be used? Well, it depends. The structure and volume of data should inform the method and the approach that needs to be taken. Hence, there is not a one-size-fits-all solution when it comes to machine learning. Next we will talk about deep learning, a powerful machine learning technique. https://abeyon.com/wp-content/uploads/2018/11/0.png 600 1703 Mallesh Murugesan https://www.abeyon.com/wp-content/uploads/2015/03/logo_abeyon_big-gray-300x85.png Mallesh Murugesan2018-11-15 17:05:552018-11-15 17:06:03How do Machines Learn?